Summary: The concentration of wealth and power during the past forty years continues, even accellerates. Anyone familiar with history can see how this will change America. Now we enter the next stage. Like the plutocrats of the gilded age, they claim virtue and efficiency in addition to wealth. Such as Peter Thiel, speaking as a voice of the New America. Money always finds its spokesman. Question: You once told The Wall Street Journal, referring to President Obama: “I’m not sure I’d describe him as a socialist. I might even say he has a naive and touching faith in capitalism. He believes you can impose all sorts of burdens on the system and it will still work.” Is that still true? Thiel: Yes. I think there is an incredible faith in capitalism — that you can put any burdens on business, and people will just work. It’s like people are hardwired to make money and there’s nothing you can do to change that, irrespective of politics. In that sense it is an incredible faith in capitalism that I don’t quite share. Theil seems delusionally unaware of US history. The excesses of the Gilded Age that prompted the regulations of the Progressive Era and New Deal. And that the US has experienced 30 years of tax-cutting and deregulation, taking both taxes and regulations now at levels far below those during the post-WWII years of rapid growth. His belief that Obama has imposed unusual burdens is equally absurd (Obama’s a laisze-fair conservative by comparison with Nixon’s regulatory surge). (3) An alternative to reading this fascinating and self-revealing essay: “Libertarian inadvertently argues for 90% marginal tax rate“, Amanda Marcottte, Pandagon, 23 April 2012. The rich always find courtiers to justify their wealth and power: “The Creative Monopoly“, David Brooks, op-ed in the New York Times, 23 April 2012 — A giddy Brooks describes Thiel’s love of monopoly, dressed in tinsel for gullible Americans. 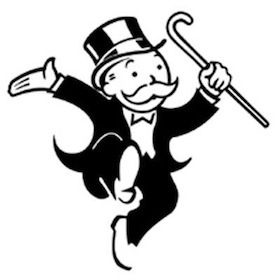 Anyone familiar with real monopolies and near-monopolies, from Standard Oil to Microsoft, will laugh at this. Previous Post Today we ask the mineshaft: we know what’s wrong with America, why can’t we fix these problems? Peter Thiel is a certifiable wack job. He pays young people to drop out of college. He donated 2.5 million dollars to Ron Paul’s presidential campaign — Ron Paul is a guy who thinks we should shut down the IRS and let individual citizens print their own money, Ron Paul is a doctor who’s a creationist…how he reconciles that with prescribing vaccines, I’d really like to know. So Thiel might not be the best representative for the billionaire class. Somebody more stable and reality-based, like Bloomberg or Bill Gates, might better represent that group. We don’t have the data to give definitive answers, but IMO Thiel is typical of the 1% that are shaping the New Merica. That’s done by the committed, will to use their money and influence to change America. You might prefer the quiet ones who use their money in a traditional manner, they’re seldom the sort of people who mold history. My question is this: Where can a recovering plutocrat go for an education in civics? Should there be an AA for plutocrats? Ask yourself why a Plutocrat in the New America might see the need to “recovery”, or for an education in civics. His think tanks teach a civics of which he approves. Actually — if it weren’t for the fact that the nationalists, Dominionists, plutocrats, self-appointed Pharisees, etc. have in many respects already succeeded in hijacking it for their own purposes — I might be inclined to recommended Christianity with its repeated emphasis on concern for the less fortunate and cautionary statements regarding preoccupation with the material world. If we wanted to try something really crazy, we might read about the Jesus guy. He said some interesting things. Someday we might try some of his ideas. Perhaps even create an organization focused on spreading his ideas, and helping people live by them. I don’t know if that’s a practical idea, or even possible. — Dom Hélder Pessoa Câmara, Roman Catholic Archbishop of Olinda and Recife. Of course, under some circumstances this could lead to death by murder of the Catholic clergy espousing such beliefs. I need not list examples, I think. Brave men and women who gave their lives fighting against truly wretched poverty. The name Oscar Romero comes to mind here, but sadly he’s not the only example. Here is the US, however, the brilliant, transcendent and glorious teachings of Ayn Rand are considered to be entirely compatible with Roman Catholicism, as long as you pay lip service to a few pet Catholic issues. Just ask Paul Ryan, who gloriously unites Rand and Jesus Christ in his person. Truly, we live in glorious times! People don’t seem to get the simplicity of how the higher personal/corporate/capital gains taxes worked in creating higher growth levels in the post WW2 to about 1970.. It was ‘use it or lose it’. Say if you were a corporation and you made a great profit. Then you had to spend it or the Govt took it .. and then it would spend it. So you paid higher wages , thanks to that people bought more, so you also spent on capital investment. The Govt had lots of money and it spent on people and infrastructure, which lowered your costs and increased demand. So you made larger profits .. and so on. It ended with the 72 oil crisis. And all those, waiting in the wings, ‘neo-liberals’ seized their moment. Just like their later, much more violent cousins, the ‘neo-cons’ did after 9/11. It was all nonsense of course. We, much oil dependent societies at the the time, took a major hit which created a wave of inflation. It was dealable with. Some countries, like Japan and France dealt with it quite easily. The real issue was to reduce oil dependence and improve energy efficiency. The way the ‘Anglo-Saxon’ countries did it was to smash unions, living standards and their economies while exploiting new oil finds like Mexico and the North Sea. The damage done by people like Thatcher to their economies was papered over by the subsequent lower oil prices and/or oil income .. for a while. Note that what is known as ‘neo-liberal’ economics, or the ‘Washington consensus’ was purely a political ideology, which had about as much relationship with reality as communism or national socialism. And will go the same way into history as both those did. Any system based on systemic, organised looting is not going to survive. I mean, most of it didn’t even pass the ‘laugh test’ … like the efficient markets theorem (EMT) where everyone in the market has perfect information and perfect knowledge of the future. I mean who took this seriously? Or Greenspan or Bernanke, who say that ‘financial crime cannot happen’ (because of the EMT, you like the circular logic?)). Bit like Hoover saying ‘organised crime does not exist’. But therefore no one gets prosecuted, since their crimes are impossible. Sadly too many did drink the ‘cool aid’, including nearly all the suckers who got screwed by it. Now we are in the end game. Their nonsense has so impoverished their overall societies, made them so incapable of building for the future or even dealing with relatively straightforward issues. But as their societies get poorer, they have to loot more, just to maintain their position. Which means the society gets even poorer, which means they have to loot more .. and so on … the classic ‘downward spiral’.. Meanwhile the US Fed is now printing unlimited money, not one single cent of which an ordinary person will ever see. Like pay off their mortgage, pay their student loan, pay for an infrastructure project, pay for R&D, pay for a whole new transport system … and so on. But asset values will be inflated and the speculators can have unlimited money at no cost .. to them. Hmmm, what can possibly go wrong with this scenario? I always said that we had Reagan in the actual government, but we also had a shadow government of folks like “Neutron Jack” Welch and Al “Chainsaw” Dunlap. Ridiculous men with ridiculous gangster nicknames who did as much damage to this country by starting business trends and corporate policies as some of the more boneheaded government policies did through the law. It’s not just that they damaged the companies they themselves mismanaged, they did so to such personal financial success (never mind what they did to actual American wealth) that there destructive ideas were replicated throughout the corporate sector. Dunlap was influential in his day, but was ultimately to openly crooked to survive. Other, more careful men (Mitt Romney, for instance) were able to prosper using the business model that Dunlap pioneered. “Neutron Jack” is still revered by many in the business world. And concepts he pioneered like Stack Ranking are still creating rack and ruin throughout society.